In the year 2000, the Northwoods Improvisers srtarted playing with reed player Faruq Z Bey. The connection was made throuqh Len Bukowski – Charlie Parker discographer, San Ra enthusiast, record store owner and reed player who knew them in separate contexts. After Bey and the Northwoods met, it turned out they alrady knew each other: the Northwoods had played the opening set at a 1984 concert in their Mount Pleasant home town, on the occasion of a visit by Bey’s qroup Griot Galaxy. That first encounter was a one-off event, but at this second meeting between Faruq Z. Bey and the Northwoods something sparked. The time was right: the musical empathy betwen them even at the outset was extraordinary, and it has grown and strenqthened over the interverinng years. Faruq Z Bey and the Northwoods have continued their musical association to this day. Their joint projects have already qenerated three CDs on the Entropy Stereo label: “19 Moons” (2001), ” Ashirai Pattern” (2002), and “Auzar “ (2004) – this album is the fourth document of the music they create together. At the time of the encounter in 2000, the Northwoods Improvisors – Mike Gilmore – Mike Johnston and Nick Ashton – already had a long journey behind them, creating and exploring a musical terrain which is all their own. Their extended explorations of particular rhythmic and harmonic ideas incorporate reworkings of Indian ragas alongside music derived from Islamic traditions, while taking inspiration from Albert Ayler, Sonny Clark, John Coltrane and Ornette Colerman too. Check out their own albums on the Entropy Stereo and ARC labels: ” Spinning”, “Fog and Fire”, “Star Garden”, “Branches”, and more. Their music is totally original. It’s exploratory and adventurous, and inclusive too, with a wide appeal well beyond the usual jazz or improvised music audience. Their musical interests turned out to be a natural fit for those of Faruq Z. Bey, a Detroit musician well known for his work in Griot Galaxy, which had links and affinities with both the Art Ensemle of Chicago and Sun Ra’s Arkestra. Faruq’s music is strongly influenced by Sun Ra, as a poet, philosopher and composer as well as a bandleader. The Egyptian and eastern references. the “science fiction” elements at Griot Galaxy’s music, and a number of compositional techniques all attest to this Ra influence. 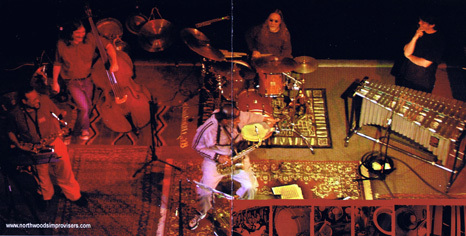 Conisider, too, the piece “The Shadow World“, included on both a Griot Galaxy album and on “Ashirai Patterrn“ with the Northwoods improvisers: its 7/8 rhythm and ferocious tonality make it a rarely-covered Sun Ra composition, but a natural one for these particular musicians to explore. 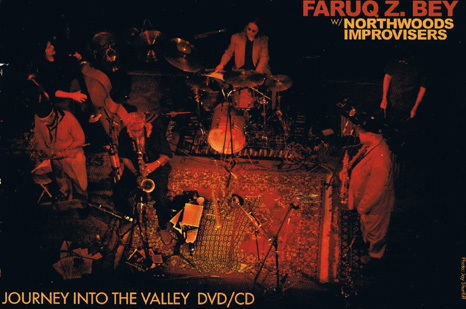 Faruq’s compositions have particular qualities which are well matched to the Northwoods Improvisers. He summarizes his compositional approach as “text and commentary”. The aim, he says, is to provide a minimum of information while stimulating maximal commentary (improvisational development, musical discussion) from the performers. The core of his compositions are particular “texts” – specified melodic and harmonic elements – but these are also underpinned by rhythmic patterns specific to each piece. These rhythmic elements of the compositions can be multi layered and also complex in themselves. Bass player Mike Johnston idientifies this as a key feature of Faruq’s compositions, and emphasizes too the complexities and interconnectedness of these elements: particular compositions may employ scales and/or rhythms which alternate between different patterns, and bassist and drummer are frequently required to play completely different time signatures. On the current album, Faruq’s arrangement of “Zychron“ is a case in point, with a 5/8 bass line underlying improvisations based on a 4/4 feel. Of “Fosters“ (not quite 4/4, an open rhythmic pulse). Faruq says that is named for a favorite eating place he once knew. The composition’s bluesy feel recalling the southern menu and atmosphere. On this album “Fosters“ is melded with the weIl known “Blue Monk“. In the case of another composition “Sound By Law“ (otherwise known by its Arabic title “Sherrif Sam“), musical theme as “text” has a literal underpinning. Faruq says that on this piece the note intervals are derived directly from the letters of the title by an analysis derived from his own research. Mike Carey and Skeeter Shelton are associates of Faruq’s from a large number of Detroit projects over several decades, their links with him include Griot Galaxy, various free music groups, afro beat bands, and a Faruq Z Bey wind ensemble. “Conspiracy Winds“. On this album. “Family Folk Song“ is composed by Mike Carey, while Skeeter Shelton contributes “In The /alley“. The rhythmic complexity and layering on these tunes is reminiscent of that on Faruq Z. Bey’s own compositions. Mike Johnston offers an insight into this: “I think that Skeeter and Mike’s rhythmic sound resembles Faruq’s because of the way we (Northwoods) maybe play their tunes. Since our band approach is very open to interpretation”. He also points out that an emphasis on rhythm is characteristic ot the region: “I do teel that there is a strong sense ot rhythm that exists in music that is created in Michigan that is unique to Michigan music. I believe this has been influenced by R and B music and Motown that was unique to this area. To be a musician playing in Michigan I feel most players are expected to be able to play many styles and rhythms. To me this sense of rhythm that is present in Michigan jazz”. “I believe is influenced to some extent by this background. Of course not every Michigan jazz player plays rhythmic jazz, but I think they are expected to be able to handle it if the occasion occurs”. The closing composition, “Mystery Of Love”, by Ghanaian drummer Guy Warren, was brought to the group by Mike Johnston. lt builds on a simple 6/8 bass riff, and includes reflective statements by Bey, Carey and Gilmore. lt is a fine feature for Bey’s ballad playing. Chris Trent is a musical researcher and author of several works including “Another Shade of Blue” (Sun Ra), and co-author with Robert Campbell of the definitive discography “The Earthly recordings of Sun Ra”. He lives in central England.